A cheese slicer can be a reliable cheese tool to sandwich lovers and crackers. It was first invented in Norway when Thor Bjørklund, a Norwegian artisan got angry at the normal knives which couldn't produce thin slices on his cheese the way he wanted them to. He even tried a variety of cutlery in his workshop to slice the cheese, but none of them could do a good job. That's when he came up with an idea of a cheese slicer. Today, his invention has proven to be an important tool in our everyday lives. A cheese slicer is a kitchen tool that is used to cut the cheese into thin, attractive slices in an even manner. Since there are two types of cheese, a cheese slice is able to slice through them with ease. There exists a cheese slicer that slices hard cheese types and another one for the not-so-hard cheese. Apart from slicing cheese, it can also be used as a tool for cutting butter, cabbage, and cucumber. A cheese slicer is a simple tool with a replaceable wire string and a thin handle. Once you start noticing that the wire has turned dull, it is time to replace it with a new wire. It is an easy tool to use. You simply place the cheese to be sliced on a slicer board, the wire part is positioned on the edge with the metallic part facing upwards, and then you slide it downwards. The wire is usually made of stainless steel that cuts through the cheese. Its length depends on the size of the cheese slicer and the cheese itself. But some cheese slicers have been designed to have an adjustable string and diameter. People confuse a cheese slicer with the cheese cutter. Unlike a cheese slicer, cheese cutters are used to slice through soft, sticky cheese types and are made of aluminum wire or a gauge stainless steel wire on the edge. The ancient cheese slicers had wooden boards that had a slot cut and a hole. The end of the steel arm of the slicer could fit the hole, and the wire goes through the slot when you slice the cheese. Unlike using the ordinary knives to slice through the cheese producing uneven sizes of slices, using a cheese slicer for your cheese will ensure it slices through a thin and even slice which will be easy to melt when used to make a sandwich. Soft cheeses like brie can be difficult and messy to cut through using knives but not when you use the cheese slicer. Cheese deposits are unlikely to stick on the wire unlike when you use a knife. Sharpening the other cutting tools every time you want to slice cheese can be tiresome and boring sometimes, but not when it comes to cheese slicers because once the wire starts to change the color you can easily replace it in minutes and you are good to go. Cheese knives are not that useful in slicing through cheese because they do not cut even slices. A cheese slicer on the other hands slices a thin, perfect and attractive slice of cheese. Use a cheese knife mostly on hard cheese. Cheese slicers are made of stainless steel which is resistant to the ability of cheese to stick. The Bellemain manufacturers take pride in manufacturing high-quality kitchen products through research on the already made products in the market then they improve their craft with creativity. Bellemain Adjustable Thickness Cheese Slicer is one of them, and I can guarantee you that it is a masterpiece for all your cheese work. It features an adjustable stainless steel wire cutter that slices out ¼ thick, extra thin cheese slices which will be suitable for all kinds of your sandwiches, burgers, and crackers. Having a Bellemain Adjustable Thickness Cheese Slicer of your own will cut down all your costs on pre-sliced cheese because from now on you can easily prepare your desired cheese slice anytime you want. Westmark is the leading manufacturers of kitchenware brands not only in Germany but also in the world for over five decades now. They stick to the principle that if a kitchenware does not serve more than one purpose, then don't have it in your kitchen. It comes with a beautiful white chopping board measuring 16 X 12 cm. The Westmark Germany big Multipurpose Stainless Steel Cheese and Food Slicer not only slices hard and soft cheese types but can also be used to cut sausages, cucumbers, lettuce and many more food products. It features a high-quality stainless steel blade of 13 cm long and cast aluminum ergonomic handle which is comfortable to use and kind to your hands. It also has an adjustable scale to measure how thick you want your cheese to be like. After use, you will not find it difficult to clean. Fox Run brand has been in the kitchenware market for 40 years now and has dominated in crafting simple but high-quality products that last ages and are appealing. 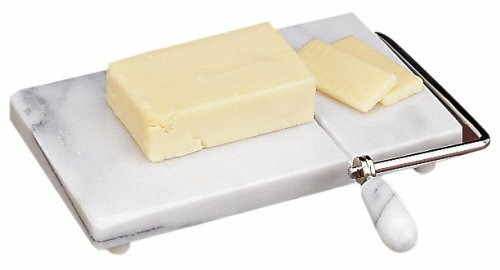 Fox Run White Marble Cheese Slicer is a simple cheese slicer that features a white marble that keeps the cheese cool, and the base is fitted with non-slip rubber pads to keep the marble from sliding and spilling your cheese as you slice. 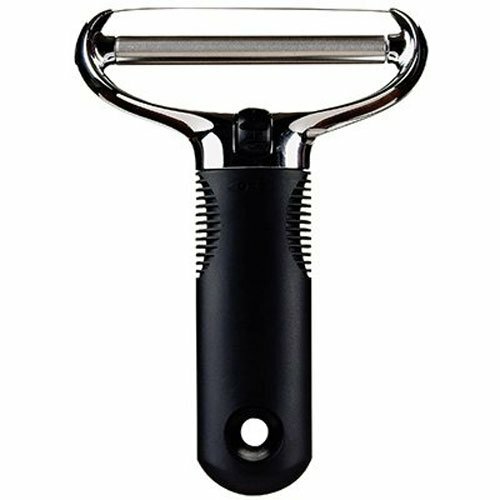 The handle bar has a durable stainless steel wire that is resistant to sticking of cheese and it is strong enough to slice through hard and soft cheese types. It also comes with two replacement wires. Prodyne is the pioneers of the Gourmet cheese slicer. They have been in the business for over the years. 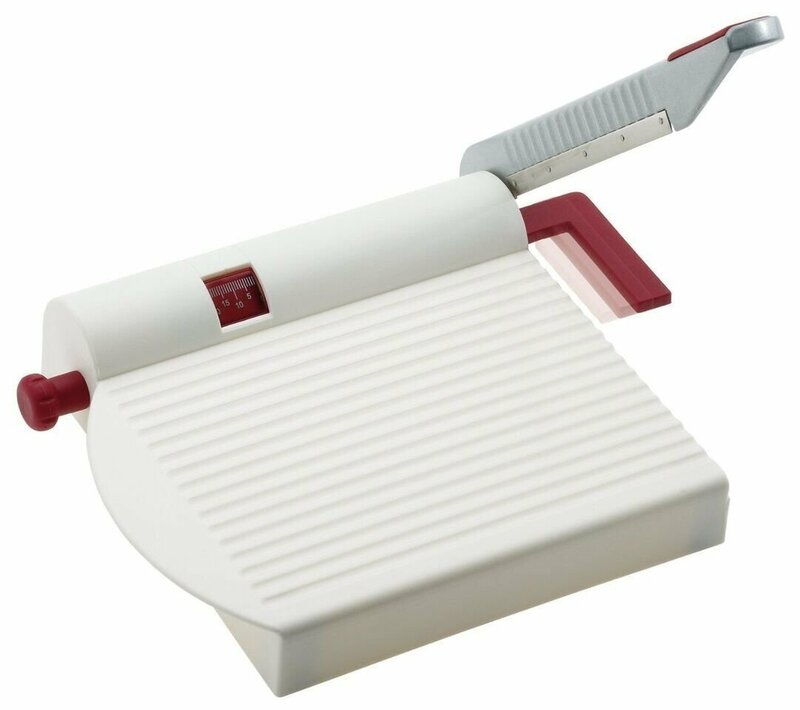 Prodyne 805B Thick Beech wood Cheese Slicer is one of their latest cheese slicers and /it features a 9.5 X 6 X 7/8 inches beech wood board with non-slip rubber soles. Its high tension cutting wire is made of replaceable stainless steel that can cut comfortably through both the hard and soft cheese types with ease with a guarantee of uniform thin slices every time it is being used. 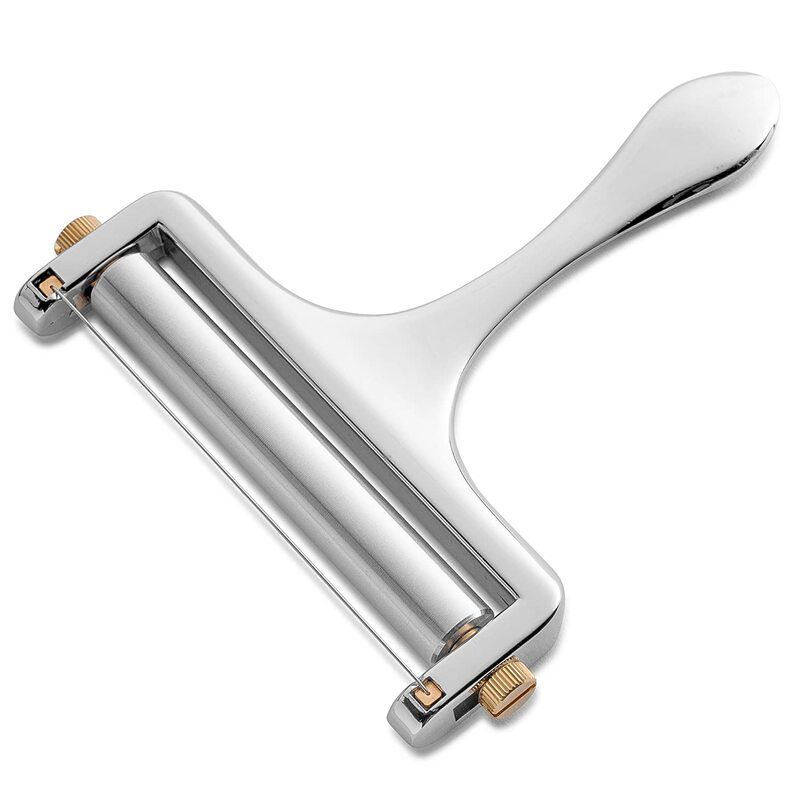 This cheese slicer is best suited for those people who like sleek and sophisticated tastes. OXO are famously known for manufacturing kitchen appliances that have soft, non-slip handles. They are the famous award winning company. OXO Good Grips Wire Cheese Slicer is one of their innovations and it features a beautiful sturdy die Zinc non-slip body. It also has a stainless steel cutting wire that has been connected with a tension wheel which can tighten the wire in case it gets lose. The body is comfortable to use and can easily slide the cutting wire through hard and soft cheese. All of these cheese cutters are not durable. That is why they either come with a lifetime warranty or two replaceable cutting wires. None is 100 % efficient. That is why I would suggest one chooses a cheese slicer that will be less annoying and embrace everything that comes with it. Fox Run White Marble Cheese Slicer proves to be the best cheese slicer among the rest since it can at least do the work. Since they are all fragile, they deserve to be handled with care for them to last.